One problem: The former Texas congressman has a lot going for him, writes Josh Voorhees at Slate, including a devoted base of supporters thanks to his near upset of Ted Cruz. He "is missing one important thing, though: an actual reason to run," writes Voorhees. He enters the race "as a man without a clear political ideology, a signature legislative achievement, a major policy issue, or a concrete agenda for the country." 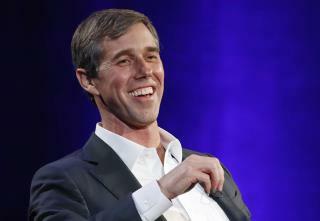 One strength: At Fox News, Matt Gorman writes that O'Rourke could indeed become the Democratic nominee because he comes off as authentic, the same trait that endears President Trump to his supporters. "For better or worse, you know who Donald Trump is and what’s on his mind," writes Gorman. O'Rourke is the same way. While he sometimes takes this approach too far, if "he can strike the right balance, he has the ability to do what almost no one in the field can do: unite the Obama coalition." The basics: Axios has a political primer on O'Rourke, including key positions (he supports increasing the minimum wage to $15) and common criticisms he faces. Included among the latter: "O'Rourke has criticized Trump's border wall approach to immigration, but has not offered concrete policy solutions." Dude: "Between the baby boomers who have had a monopoly on the Oval Office for a quarter-century and the ascendant millennials who are holding elected office in unprecedented numbers, O'Rourke is thoroughly, almost parodically Gen X," write Jessica Goldstein and Stephanie Griffith at ThinkProgress. That is, he's "a guy who spent the '90s listening to cassette tapes and getting stoned, someone who floundered and felt out of place and had a quarter-life crisis before finding his way." Pick your omen: O'Rourke is on the cover of Vanity Fair, and Kyle Swenson of the Washington Post notes that the cover shot (outdoors, by a pickup) bears an "uncanny resemblance" to a 2007 magazine cover of John Edwards in Men's Vogue. Both photos were shot by Annie Leibowitz to accompany stories by the same writer, Joe Hagan. That may seem like a bad omen, but Dave Weigel, also of the Post, points out a similarity to yet another famous cover shot of a politician, that of Ronald Reagan on Time. He is a big weird doofus. Like all the late night tv hosts said about Trump running: “Do it. Dooo it! !” Looking worse than The Hunger Games. What a circus.